Even if Windows 8.1 is considered the most secure Windows version yet, a good Internet security application is still considered absolutely essential. 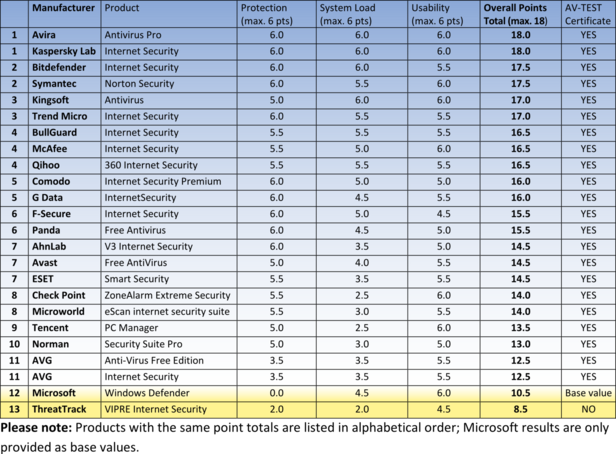 AV-TEST compared 23 security packages with the basic protection of Windows 8.1. The result: Many watchdogs are first-rate, the freeware applications are good, and Windows needs more protection. recently put to the test under Windows 8.1. In Windows 8 and the subsequent update to 8.1, Microsoft improved many aspects of security. Security Essentials and Defender, separate under Windows 7, are now bundled under what is only called Windows Defender. But is this basic protection sufficient against the latest threats from the Internet and social networks? The lab experts from AV-TEST resolved this question, along with many others. In the current test, conducted in two stages during the months of September and October 2014 at the Magdeburg labs of AV-TEST, 23 security packages were compared to the basic protection of Windows 8.1 Because the lab always tests the latest products available, some are already the 2015 versions, while others are still from 2014. Included in the test, along with 15 paid programs, are also 8 freeware system watchdogs, and naturally Windows Defender as basic protection. The packages from Avira and Kaspersky Lab excelled in the test, scoring the maximum 18 points (AV-TEST, last amended in November 2014). The scanning rates of most suites were top-notch: a total of five contenders finished error-free (AV-TEST, last amended in November 2014). Thanks to perfect performance, the new 2015 suite from Avira reached the maximum 18 points in the lab test by AV-TEST. Under the interface of the 2015 version is a well-functioning security system that achieved the maximum number of points in the test. Who protects Windows the best? In the lab, all the security suites were evaluated in terms of their protection, system load and usability. The testers awarded up to six points for each section, thus a maximum of 18 points for all tests. 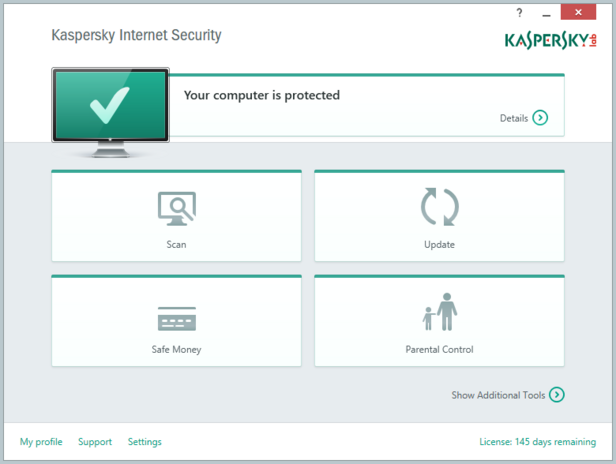 In the test on the Windows platform 8.1, two products even achieved the maximum 18 points: Avira Antivirus Pro and the Internet Security Suite from Kaspersky Lab. With 17.5 and 17 points, the solutions from Bitdefender, Symantec, Kingsoft and Trend Micro followed close behind. The first freeware solution from Kingsoft ranked with 17 points at number 3. Overall, there are 13 tiers of finishers due to tied results. 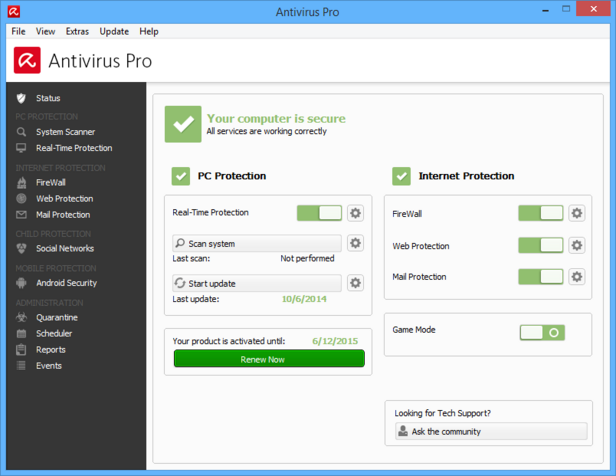 The popular freeware security suites from Avast and AVG reached a final tally of 14.5 and 12.5 points respectively. By comparison: The basic protection of Windows Defender was rated at 10.5 points. All users naturally pay close attention to the protection function of the individual products. That is why over a period of two months, the products in the test were required to withstand the real-world test and the evaluation with the AV-TEST reference set. In the real-world test, the challenge was to detect and remove some 170 select, brand-new malware specimens. Not an easy chore. The five products from Bitdefender, F-Secure, Kaspersky Lab, Symantec, and even the freeware security program from Panda, managed to score 100% in this category. This was followed by Avira, Comodo, G Data, Trend Micro, Avast and Check Point, scoring 99%. Overall, that represents 50% of all the products tested. The reference set with nearly 18,000 malware specimens includes new, along with many known, malware samples that a suite really ought to detect. And 18 products did in fact score 100% on this task. Only Avast, Check Point and both products from AVG had problems with this task, detecting only 98 or 99%. 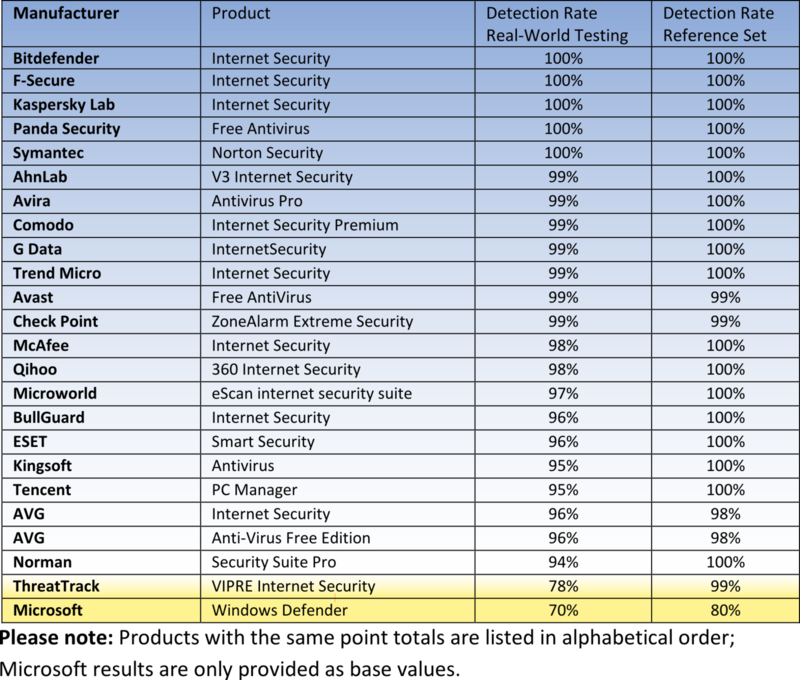 The built-in Windows Defender finished both tests with only 70 and 80% detection rates respectively. That is not enough for good protection. "Does more security mean slower PC performance?" 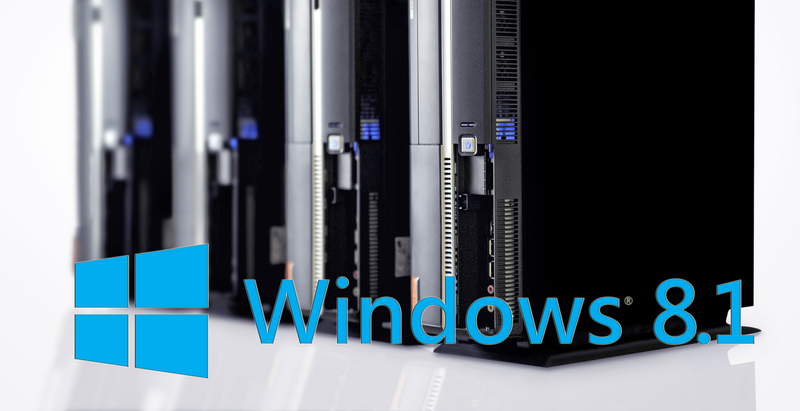 Users often claim that security applications slow down their Windows 8.1 system under routine conditions. That is why the lab evaluated just how heavily the suites impact a system in terms of reduced performance. To do so, web pages were launched, software was downloaded, applications were installed and data was copied on a reference system. The execution time was clocked and recorded for all these operations. Then each of the specified operations was repeated while each particular security suite was running. The lab awarded the highest point score of 6 to the system watchdogs from Avira, Kaspersky Lab, Bitdefender and Kingsoft, as they put virtually no burden on system resources. And this although the first three had the best scores in malware detection. All the other packages have a more or less measurable system load on the PC. In this category, the freeware suites from AVG, Avast and Panda earned only 3.5 to 4.5 out of a possible 6 points. Windows Defender was doing relatively well at 4.5 points. The system watchdog from ThreatTrack slows down the system considerably, that's why it is awarded only 2 points. All the suites had to also demonstrate that they are capable of distinguishing between friend and foe. To do so, in the lab they scanned over 330,000 benign programs, visited 500 virus-free websites and monitored a few dozen installations of applications. The suites from Avira, Check Point, Kingsoft and Symantec exhibited not even a single false positive. The sentries from Kaspersky Lab, McAfee and Tencent were only near-perfect: they issued one to three false warnings. While all the other programs in the test had a few more false positives, there were very few annoying false warnings overall. Several years ago, this problem was much worse. The Internet security suites from Avira and Kaspersky Lab performed the best in the current test under Windows 8.1. They both earned 18 out of a possible 18 points. Hot on their heels are the products from Bitdefender and Symantec with 17.5 points. 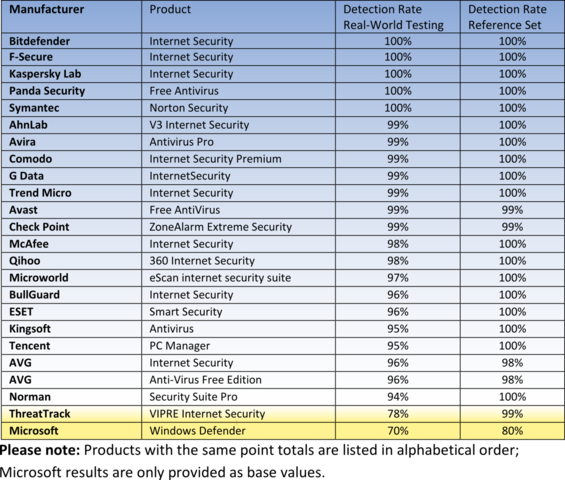 The basic protection of Windows in the form of Windows Defender, tested for comparison, received only 10.5 points. The testers awarded no points for its feeble detection performance. Exclusively among the top finishers were paid programs that cost an annual license fee of roughly 10-13 Euros per PC. That's roughly 1 Euro per month. A user ought to be willing to invest that much for good protection. Our tip: Check your existing security software online! Using the following link, you can check the security performance of your PC. The 'malicious code' used there is of course benign. It always involves a harmless test code.